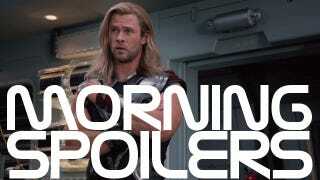 A Crazy New Rumor About The Ending of The Avengers! The latest rumor about The Avengers makes the movie's plot sound even more complicated than you could possibly imagine. Meanwhile, Ralph Fiennes drops hints about his James Bond role, and Arnold Schwarzenegger is an angelic one man army! Remember that HeroClix description we published the other day, which hinted the Red Skull could be a secret villain in the movie? It still seems pretty unlikely. Just how many villains does Joss Whedon&apos;s Avengers actually have? -The aliens are called The Redacted and are a new version of The Skrulls. Fox still own Skrulls, so Marvel have changed them enough to not get sued. They're multicoloured and are shapeshifters. -Thanos is in the movie. There were rumors some months ago that Loki would do business with Thanos and they're true. Thanos is tricked by Loki in the movie. Basically, Loki has been collecting Infinity Gems and the Infinity Gauntlet, but tricks Thanos in to thinking that the Infinity Gauntlet is the most powerful. In return, Thanos gives him The Redacted. -The Leviathan is an alien serpent given to Loki by Thanos as a part of the deal. -Red Skull is in the movie. Loki meets him on his travels. They split the 6 Infinity Gems between them. Loki takes the Mind, Reality and Power gems and Red Skull takes the Soul, Time and Space gems. -The Redacted discover that Loki tricked their master, and betray him. Hence Loki seemingly being on The Avengers side in some set photos. There's a lot to digest there, chief among them that the Skrull have actually been renamed as...the Redacted? Or they have some other top secret name that has simply been redacted? I'm not sure, though I find it much more amusing to assume it's the first. All in all, this doesn't seem to really fit at all with what we've heard or seen of this film — indeed, the set photos from the apparent climactic fight scene seemed to fairly clearly show Loki fighting the Avengers, not allying himself with them — but again... what these spoilers presuppose is, what if most of the movie was shot in secret? So yes, I can't really argue any of this, though I'm still going to be a contrarian jerk and remain deeply, deeply skeptical about all of this. "Ralph Fiennes plays a government agent, which we never get a name on, because he is set to play the new M. Skyfall centers around M (Judi Dench) where her past forces her to leave as head of MI6, and find a new M. The board of MI6 then turns to a government agent (Ralph Fiennes) to take over. M (Dame Judi) is now forced to train the new head of MI6." Here's a TV spot for the Daniel Radcliffe-starring 19th century horror movie. "About a month ago, it was tested and scored very well. So well the studio gave us more money to enhance the FX. Soon, it'll be done and ready for a theatrical release. Because of the ‘Spring Break vibe' in the film, spring was the obvious time to open it. And because Dimension Films financed the movie and owns the movie, they call the shots on when it's released worldwide. So, that's the long and short of it. All good. In theaters this spring. See you then." "It's about her journey into a very new phase, a new chapter in her life that connects her to her past that she didn't know about before. Her world is basically turned upside down in the pilot and [the show] follows her through trying to put the pieces together, while she's catching the worst of the worst coming back and wreaking havoc on the good people of America." "There's definitely secrets he's keeping from them. He lets stuff out, but really lets it out in a very thin trickle. It's not like a big idea of you become president and then go, 'All right, let me show you what's in the secret closet where the aliens are.' It becomes very need-to-know with him, because he's old-school G-man." "I've gotten used to working this way from having done a show with these people before. I enjoy having to fill in my own blanks at the beginning. If stuff gets revealed later, even if it seems contradictory, I always feel that contradiction is what makes us people. So when you behave in a way that's not how people would have expected, it's a very human way to behave. So I've always enjoyed those moments myself as an actor." Here's a promo for the eleventh episode, "Adventures in Babysitting", which kicks off the second half of season seven on January 6. Here's a promo for the upcoming second season. Here's a promo photo for this week's episode, "The Hounds of Baskerville."